That’s Steve Ballmer, CEO of Microsoft. He’s a super smart guy, so we chuckle in that superior and satisfied way (as I type on my Apple Air Notebook). I came across this quote recently, did a bit of research and believe he really said it. (“The problem with internet quotes is you don’t know if they’re true.” ~ Abraham Lincoln) I can’t find an attribution date, but will give Big Steve the benefit of the doubt and assume he made this observation when Google was still a nascent upstart, not the monolithic giant we now recognize. But still, Big Steve should, I think, know better what is lurking in the shrubs, waiting to steal his Power Rangers lunch pail. So, what lies are we telling ourselves? 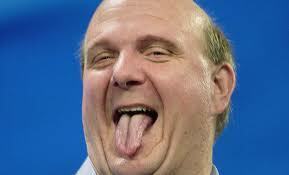 In business we might, à la Steve Ballmer, proclaim some notion of invincibility–and believe it to be so. That didn’t work out so well for Steve. The same might apply to any and all aspects of life. I don’t want to belabor this notion, but the quote brought me up short. I cannot escape the recursiveness of such thinking. “I am lying.” That is one of the word-games philosophers sometime play. If I say I am lying, then am I lying in saying I am lying, which would mean I am telling the truth? But I said I was lying. Get it? Word games. So painfully frustrating. But words are all we have. Really? “Whereof one cannot speak, thereof one must be silent,” said Wittgenstein. Okay, time to move on. I’ve always wished to be an old philosopher and sometimes I can’t help myself. At least I’ve accomplished one out of two.